I love granola! It's perfect on yogurt, cottage cheese or with some milk. I love the combo of toasted oats, nuts and dried fruit. 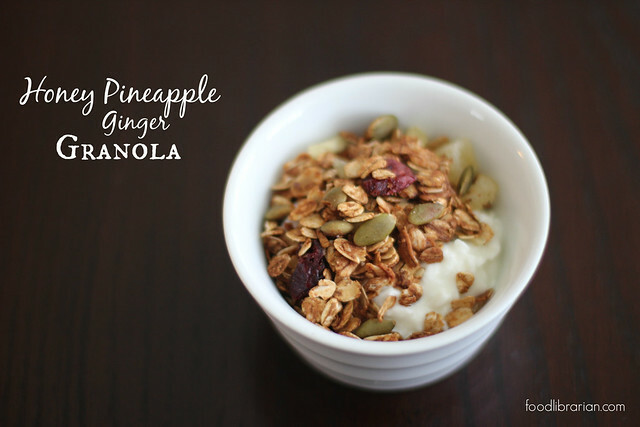 I don't make it enough...but that'll change because I really like this recipe for Honey Pineapple Ginger Granola! It's simple, fast, and tasty! 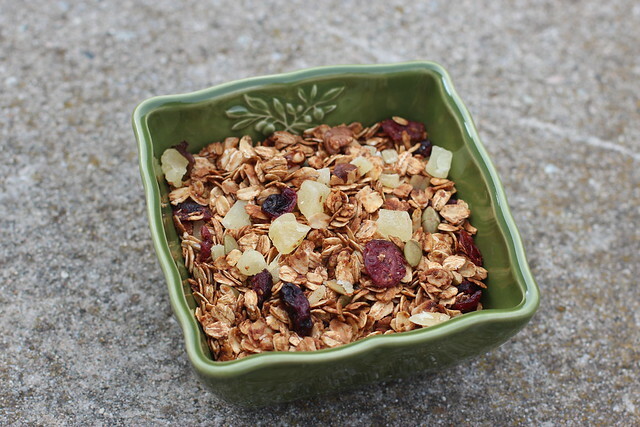 This granola is filled with sweet, spicy and all things in between! It has old fashioned oats, Dried Pineapple, Crystallized Ginger, Dried Cranberries, Pepita Seeds, Walnuts, and Ground Cinnamon, Ground Ginger, and Nutmeg. The secret sauce is a combo of honey and coconut oil. This recipe is inspired by "Honey and Hazelnut Granola" that Valerie Bertinelli made on her Food Network show. She used hazelnuts and dried apricots. Also, her batch was larger (I halved the basic ingredients). I used walnuts and pepitas seeds, along with 2 cups of old fashioned oatmeal. I never have quick-cooking oats that were called for in the original recipe, but everything turned out fine with the old fashioned oatmeal. The nice folks at Costco sent over some products to try including Kirkland Organic Coconut Oil and Kirkland Organic Honey. I've noticed that Costco is carrying a lot more organic products, including fresh produce. I made the Carrot Ginger Soup earlier with the Coconut Oil, and I've been using it to make popcorn practically every day. I already use the Kirkland Organic Honey (comes in a three pack). When I get sick, the first thing that usually hits me is a sore throat. I always reach for my honey bear (shouldn't honey ALWAYS come in a honey bear? ), lemon juice and lots of hot water. My folks use the honey as well - my dad likes honey as the sweetener in his coffee. 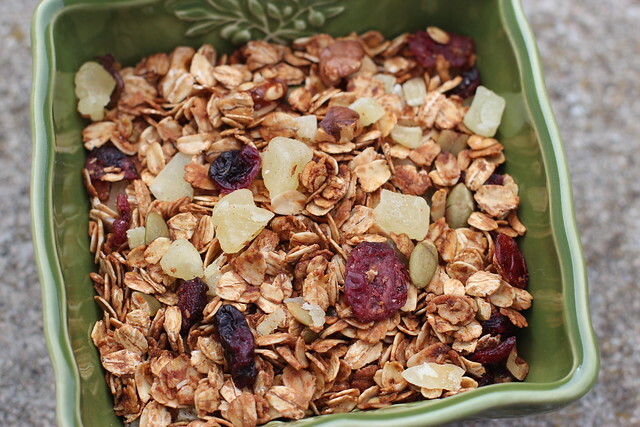 I chose to include dried pineapple, crystallized ginger and dried cranberries in the granola. You can have any dried fruit you want, although the crystallized ginger adds a special ginger flavor. How do you eat your granola? I like mine on top of plain yogurt or cottage cheese! 3. In a large bowl, mix together the oats and nuts. 4. In a small saucepan, heat the honey and coconut oil until melted. Remove from heat. 5. Add spices and salt to the honey mixture, and stir to combine. 6. 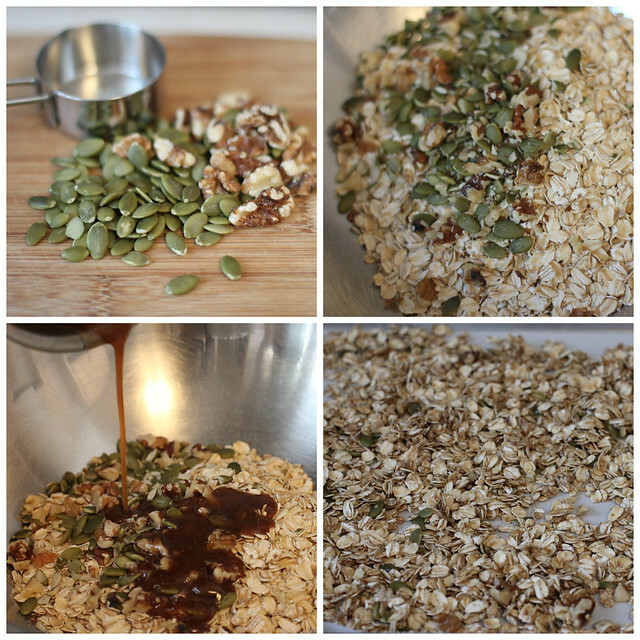 Pour hot mixture over the oats and nuts and stir until everything is well coated. 7. Spread oats onto baking sheet. 8. Bake until toasted, about 25-30 minutes. Mix at half-way point. 9. Let cool then add the chopped dried fruit. Store in an airtight container and enjoy! 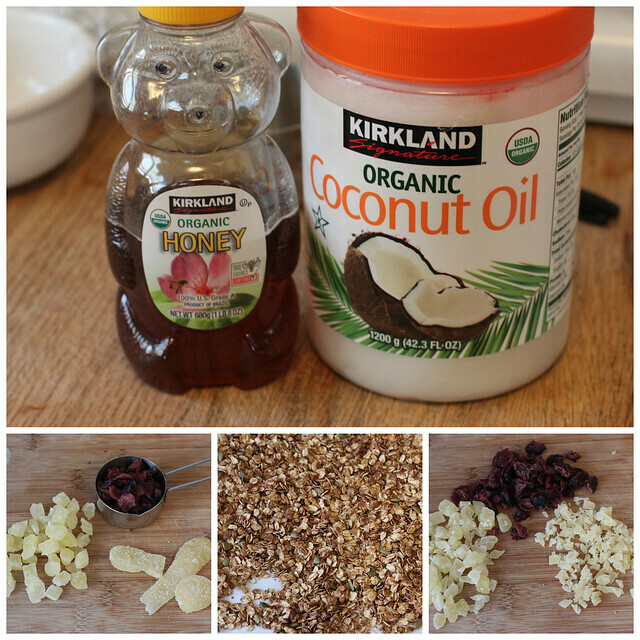 Disclosure: Costco sent me some products to try including Kirkland Organic Coconut Oil and Kirkland Organic Honey. I was not paid for this post. Opinions are my own.